Click the "Planned" tab in the menu ban then click "Create PM". Fill in the information on the form. Only Start, PM Frequency (Number and Unit) are mandatory. Start: (Mandatory) The date you wish the PM to start generating workorders. Priority: PM Priority. May be 1: Urgent 2: Priority 3: Normal 4: Low 5: None. Assigned To will be automatically set to the Default name in Configuration. You can set this to any name, or leave blank. Email Notifications: You can set Email notification on PM generation by filling in these fields. For multiple Email addresses, seperate with a comma (email1@mycompany.com, email2@mycompany.com). PM Frequency: (Mandatory) is the numeric number of how often the PM is to be performed. Such as 1 per week would be 1. Once a month will be 1. The unit "month, day, year" will be set next. Unit: (Mandatory) is the unit of measure for the frequency. Your options are "Day", "Week", "Month", "Year" and "Meter". Meter is for metered PM's. Pre-Notification: (Not to be confused with PM Frequency) Use this ONLY if you wish to be notified of this PM a specific number of days other than the default Pre-Notification set in the Configuration settings. Meter Reading of Last PM: is the last PM meter reading if PM Unit above is set to "Meter". Last Generated + Freq: This will generate PM's from the last generated date and not the completed date. Use this if you always want the PM to be on the same day etc. Last Completed + Freq: This will generate PM's from the completed date of the last PM. Use this if you want the PM to always generate after a specific length of time. Asset #: You can use this field to assign an asset number to this PM. Equipment: is a drop down box of equipment you've added in the "Equipment Admin" screen. You Can Add New Equipment if your equipment is not in the current listing. Simply click "Add Equipment" to the right. A new window will open where you can add the equipment information. After adding the equipment, you may come back to this window, refresh (F5) the window then select the new equipment. Parts: Part names and quantities of parts normally used on this PM. You can add as many parts as you wish after you create the PM. 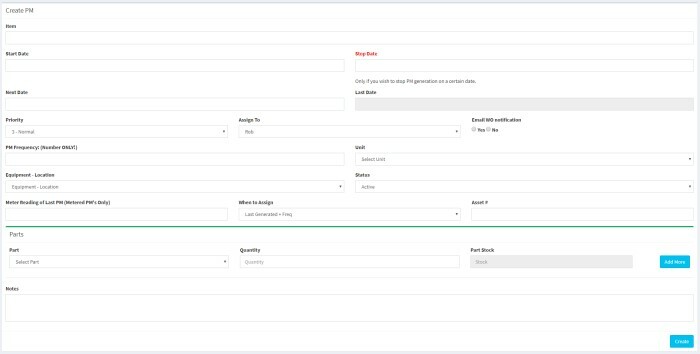 Parts are listed from the Parts you've set up in the "Parts Admin" screen. These parts will be removed from your part inventory on PM completion and you will be notified if stock drops below your notification level. You Can Add New Parts if your part is not in the current listing. Simply click "Add New Part" to the right. A new window will open where you can add the new part information. After adding the part, you may come back to this window, refresh (F5) the window then select the new part. Status is either "Active" or "Hold". Use Hold if you want to stop PM notifications and work order additions but don't want to delete the PM completely. That's it! Enter as many PM's as you wish.